April is National Grilled Cheese month! Who knew? Not I, or we would have eaten a lot more grilled cheese sandwiches around our house. Everyone in our house loves grilled cheese sandwiches and they are the perfect start to a lot of other great sandwiches as well. The grilled cheese BLT is one of our favorites. And if you add egg to it you have the Spanglish sandwich, which is delicious. And if you need a few more ideas on dressing up a grilled cheese, Kevin Lynch has 30 amazing grilled cheese sandwich recipes you should check out. 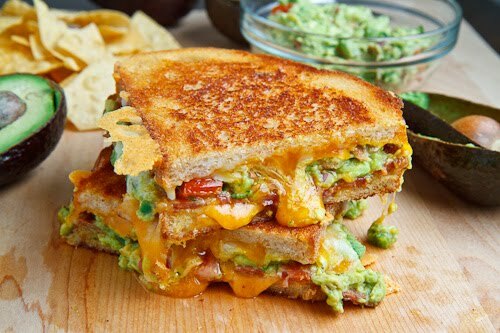 You can see all 30 amazing grilled cheese sandwiches (like the bacon avocado grilled cheese above) over at Closet Cooking. You had me at bacon! Yum yum yum! !